Note: This John Pickering of Norley died the same year as our ancestor, John Pickering of Frodsham. 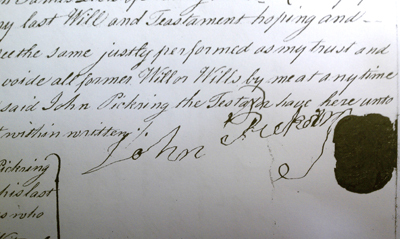 John of Frodsham died without a will and his youngest sons, Peter and William were executors of his estate. I likewise give and bequeath to my said Wife all my Household Goods and Furniture plate and china which may be in or about the House now live in or inhabit at the time of my decease for her life. I give divise and bequeath unto my son William Pickering all those my several messages or dwelling Houses with the gardens there unto belonging situated lying and being in Union Street within Stockport in the said County of Chester known by the name of No 29 and 30 to hold to him my said son William Pickering his heirs and assigns forever. I likewise give and bequeath to my said son William my large foleo Bible and my silver cup after my Wifes decease. And as I owe to my said son William twenty pounds if the same should not be paid before my decease then my said son William is to take the said sum of Twenty pounds or debt to himself and … it. I give devise and bequeath unto my Son Thomas Pickering all that my messaguage or dwelling House garden orchard and the several closes pieces or parcels of Land therein unto belonging situated lying and being in Norley in the parish of Frodsham and said County of Chester. To hold the said last mentioned messuage or dwelling house garden orchard closes pices or parsels of Land seat in Waverham Church herediments and premises unto him my said Son Thomas Pickering his heirs and assigns forever. Subject to and chargable nevertheless with the payment of all my just debts in twelve months oafter my decease. I give and bequeath to my said son Thomas my Clock and silver cream jug after my Wifes decease. I likewise give and bequeath unto my said granddaughter my six silver Tey spoons after my Wifes decease. And whereas I have now due and owing to me two Hundred and fifty pounds that is in the hands of Charles and Ralph Williamson aforesaid. Now it is my Will and mind that my Executors in twelve months after my Wifes decease to call in the said sum of two hundred fifty pounds and pay one Hundred to my son William as afore directed. And the remaining one hundred and fifty I give and bequeath to same to my Daughter Mary now the Wife of Samuel Harrison. But if my four children should disagree in their respective share or shares, the it is my Will and mind and I order and direct my Executors to sell the same and the money arising from the same to be equally divided amongst my four children share and share alike. Signed sealed by the within named John Pickering and by him declared and published and for his last Will and Testament in the presence of us who have hereunto subscribed our names as Witnesses hereto in the presence of the said Testator and of each other.